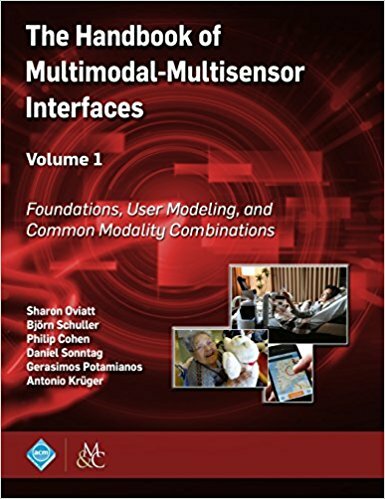 The Handbook of Multimodal-Multisensor Interfaces provides the first authoritative resource on what has become the dominant paradigm for new computer interfaces- user input involving new media (speech, multi-touch, gestures, writing) embedded in multimodal-multisensor interfaces. These interfaces support smart phones, wearables, in-vehicle and robotic applications, and many other areas that are now highly competitive commercially. This edited collection is written by international experts and pioneers in the field. It provides a textbook, reference, and technology roadmap for professionals working in this and related areas. This first volume of the handbook presents relevant theory and neuroscience foundations for guiding the development of high-performance systems. Additional chapters discuss approaches to user modeling and interface designs that support user choice, that synergistically combine modalities with sensors, and that blend multimodal input and output. This volume also highlights an in-depth look at the most common multimodal-multisensor combinations-for example, touch and pen input, haptic and non-speech audio output, and speech-centric systems that co-process either gestures, pen input, gaze, or visible lip movements. A common theme throughout these chapters is supporting mobility and individual differences among users. These handbook chapters provide walk-through examples of system design and processing, information on tools and practical resources for developing and evaluating new systems, and terminology and tutorial support for mastering this emerging field. In the final section of this volume, experts exchange views on a timely and controversial challenge topic, and how they believe multimodal-multisensor interfaces should be designed in the future to most effectively advance human performance.